The path of seeing (Skt. darśanamārga; Tib. མཐོང་ལམ་, tonglam, Wyl. mthong lam) — the third of the five paths. For both the Basic Vehicle and the Great Vehicle it is defined as follows: “the path of seeing is the direct perception of the truth of reality through non-conceptual samadhi concurrent with intelligence that immediately follows supreme attribute.” The path of seeing is said to mark the point at which one becomes an Arya, or a noble one. According to Patrul Rinpoche, “It is called the path of seeing because it is here that one first sees the supermundane wisdom of the noble ones.” It is the entrance to the the first bhumi, known as Perfect Joy]]. The first bhumi also includes post-meditation, but while some scholars such as Mipham Rinpoche and Gyaltsab Darma Rinchen have claimed that there is post-meditation on the path of seeing, other scholars, including Gorampa, assert that it is taken up entirely with meditative equipoise. It is divided into sixteen moments. 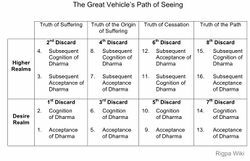 According to the Basic Vehicle the path of seeing is defined as the fifteen moments, from the first moment —acceptance of the truth of suffering— to the fifteenth moment of the subsequent cognition of the truth of the path. The sixteenth moment of cognition is the path of meditation only, since there is no previously unseen truth to see; instead it familiarizes one with seeing the truth. ↑ See the Treasury of Abhidharma, 6.28. This page was last edited on 20 February 2018, at 21:58.